Shine Or Die: Director’s Cut With Commentary! Xuanwu: This was an early idea for the opening. Erin: It was the twist that got the characters of Hellsing and R.O.D together. The story went straight to the Wells plot instead, for the sake of being streamlined. Joker: Agent Paper, the British Library has a job for you. Yomiko? What is it, sir? Joker: Our original edition of Dracula is overdue. We need you to go to the patron’s house and retrieve it. 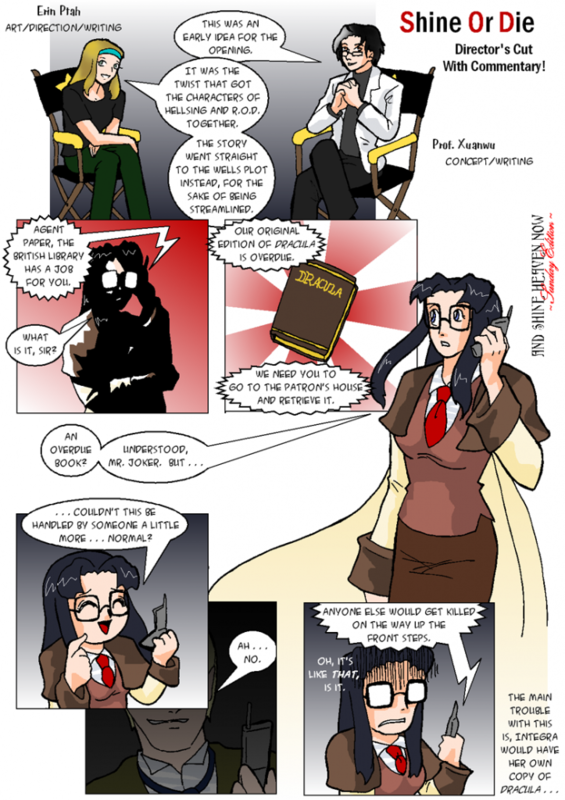 Yomiko: An overdue book? Understood, Mr. Joker. But…couldn’t this be handled by someone a little more…normal? Joker: Ah…no. Anyone else would get killed on the way up the front steps. Yomiko: Oh, it’s like that, isn’t it. Cameo is one of the characters from Okashina Okashi. This doesn’t make any sense! If I died in 1897, how would people in 1997 know to come to 1897 to kill me in the first place? Isn’t that a plot hole? Cameo: This definitely isn’t our Tokyo. Time to try the next one. 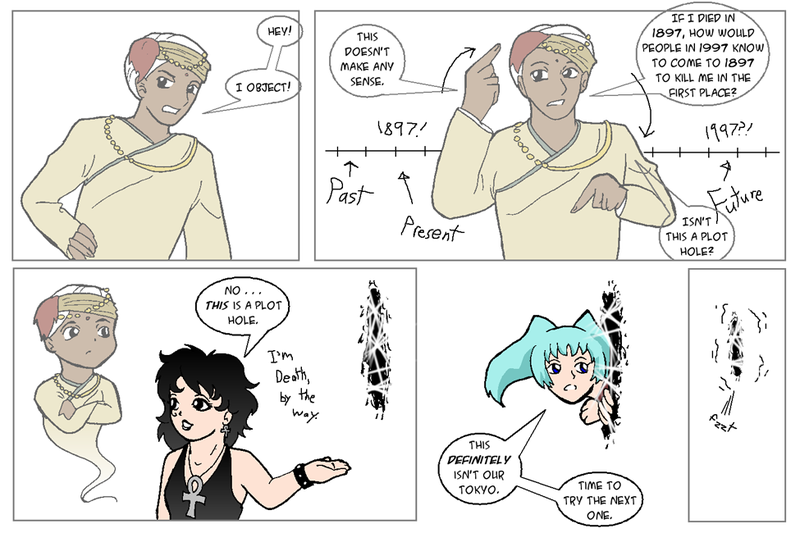 Yumie activates the time machine. Heinkel grabs Nenene and follows. Yomiko, of course, flies after her. Alucard grabs Integra, who has begun shifting rapidly, and follows as well. 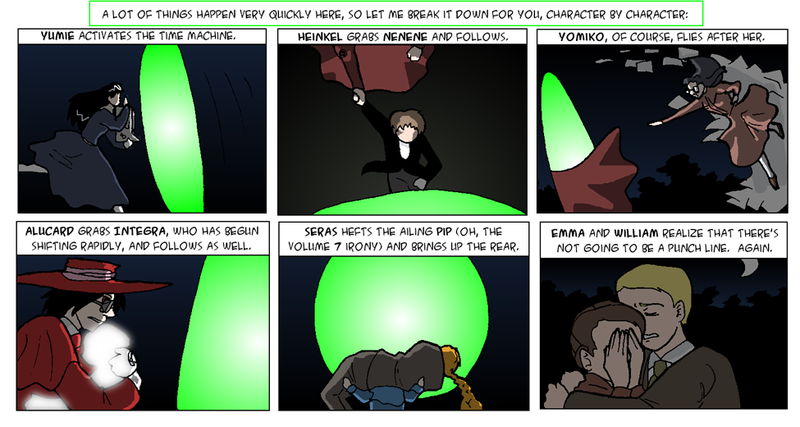 Seras hefts the ailing Pip (oh, the volume 7 irony) and brings up the rear. Emma and William realize that there’s not going to be a punch line. Again. Note from The Future: Should’ve given this one a sound effect. A surprising number of readers missed the fact that Hakim just took a bullet to the head. Heinkel (thinking): So that’s why she’s been so aggressive. Yumie’s been trying to make up and meet this dumb writer! Heinkel: Yumie, you stupidhead! Get the time machine! Erin: In the original idea, Alex was the Iscariot agent who showed up. Xuanwu: But we realized that Yumie/ko had to be in there. Besides, Anderson gets enough love already. 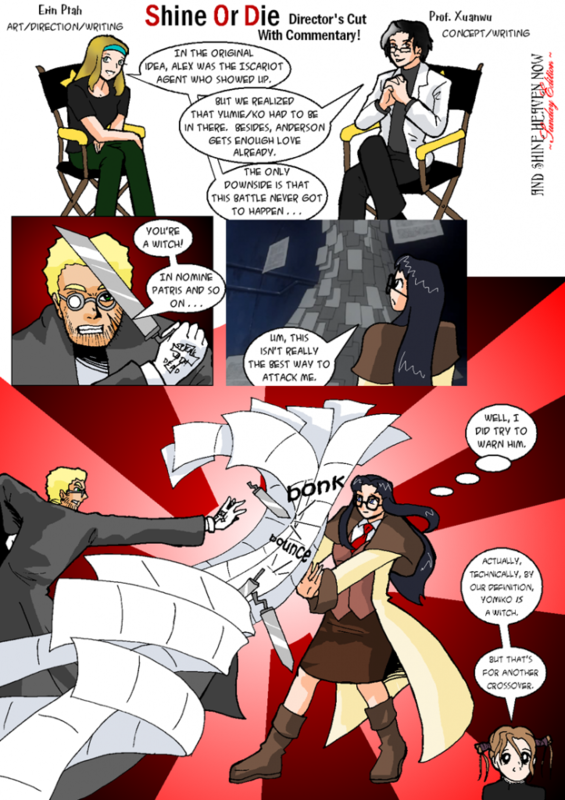 Yomiko: Um, this isn’t really the best way to attack me. Yomiko (thinking): Well, I did try to warn him. Robin: Actually, technically, by our definition, Yomiko is a witch. But that’s for another crossover. Alucard (thinking): And that takes care of that.